Gift shops can increase their clientele and manage the tourism and traveler customer service market with this free, printable business plan. [COMPANY NAME] is a start-up Company located in [CITY], [STATE] and owned 100% by [NAME]. The Company will become a licensee of [COMPANY NAME]. [COMPANY NAME] has created a personalization product that is revolutionizing the floral industry, and is making its mark on many markets that traditionally have not had an interest in flowers, like the gift market, the greeting card market and the promotional industry. 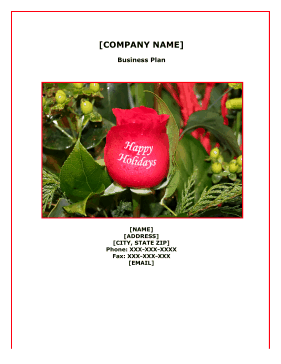 By creating a patented process that embosses your own personalized message or photograph directly onto the petal of live, fresh flowers, [COMPANY NAME] has combined the customized instant message with the emotion of a flower to create "The New Standard of Expression", and given you the opportunity to print flowers for today's era of personalization. The Company will have a storefront in the Greater [CITY], [STATE] area. [COMPANY NAME] business was formed in 2010 as a Corporation in the State of [STATE]. The Company is a start-up business in the Floral and Gift Shop Industry owned 100% by [NAME]. [COMPANY NAME] has created machinery and processes that are the finest quality available anywhere in the world. They are extremely reliable and easy to use. This state of the art equipment does not apply a sticker or a decal; it prints on the petals of flowers that look like they were grown with metallic letters as a part of the petal. There is no shellacking the flower or any other plastic looking process. It actually embosses beautiful bright colors and even metallic ink directly onto the petals of fresh live flowers. In addition our equipment can personalize wooden flowers, silk flowers, silk petals, fresh petals, soap petals, glass, wood or ceramic vases and all kinds of pots and plant holders. [COMPANY NAME]'s storefront will be located in [CITY], [STATE] area. The city proper had a 2009 estimated population of 645,169, making it the twentieth largest in the country. [CITY] is also the anchor of a substantially larger metropolitan area called Greater [CITY], home to 4.5 million people and the tenth-largest metropolitan area in the country. Greater [CITY] as a commuting region includes six [STATE] counties, [COUNTIES, all of [STATE] and parts of [STATE]; it is home to 7.5 million people, making it the fifth-largest Combined Statistical Area in the United States.